Along Rivers And Over Mountain Passes. At the start of our Seoul-Yeonghae-Bicycle-Ride we arrived at Seoul's International Airport on the west coast island of Incheon after a three hour delay to our departure from Manila. There was a long queue to get through immigration. Arriving at the baggage carousel the bikes were nowhere to be seen. By now it was 11pm and the airport was shutting down for the night. At the lost baggage counter we were told that no over sized luggage (ie bikes) had been unloaded. Dreading the fact that the bikes had been left in Manila the young man disappeared off to check with the plane baggage handlers. He returned to say that one of the bike bags had ripped and the porters were carrying it by hand from the plane. We felt sure that it must be damaged, but when it eventually came off the luggage carousel there was only some slight damage to the plastic mudguards,. Everything else was OK. Now passed midnight the bus which we had planned to get for the hour ride into Seoul city had stopped running. So we had to get a very expensive taxi van ride for the 60km ride into Seoul. Fortunately we had prebooked the GS Hotel in a convenient part of the City. We spent three days there, enjoying the sightseeing in this vibrant, clean city. 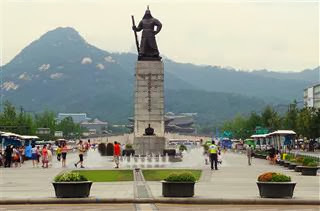 It was an opportunity to read more about the history of Korea and to understand more about the various wars that have been waged over it not to mention the continuing stand off with its northern neighbour. 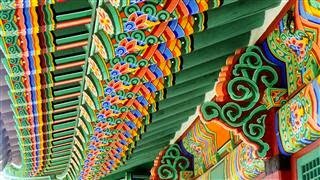 In our hunt for some of the best books about the Country we came across the very readable account called Korea And Her Neighbours by Isabella Bird Bishop. She was a traveler and writer and made her journey into the heart of Korea over 100 years ago, but her riveting account is still held up today at the forefront of books about Korea. It is a very interesting and readable story that gives a good grounding to understanding the psyche of the Korean people. The first necessity of our Seoul-Yeonghae-Bicycle-Ride was getting out of Seoul. We were rather apprehensive at the prospect, but we needn't have been. It was much easier than anticipated. From the hotel we headed up to Cheonggye Stream. 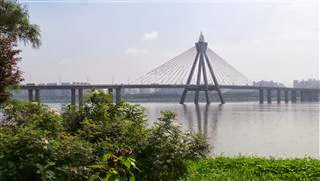 This is a beautifully clean waterway (apparently pumped at great expense from the mountains) which flows through Seoul city almost parallel with the Han river. Until about 10 years ago it was covered up and there was a huge, ugly, raised concrete motorway above it. This has now all been demolished and the area has been developed as a public green space with footpaths near the city centre and a bike path starting about 3km from the City Hall. 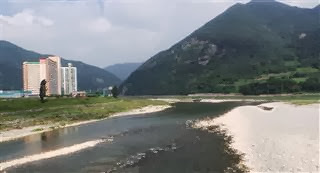 The stream joins another river which flows into Seoul's main river, the Han. 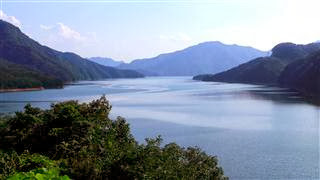 From here there is a cycle route called 'Four Rivers' which runs all the way from the coast north west of Seoul, to Busan at the south east of the peninsular. 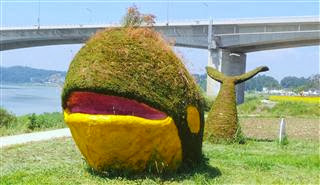 Initially the Seoul-Yeonghae-Bicycle-Ride followed the cycle path for about 40km. 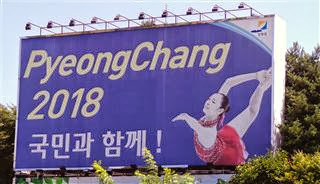 It is very well surfaced, all traffic free and well signposted with essential information in English as well as Korean. There are wayside maps but these are only in Korean. On this sunny Saturday morning there were lots of cyclists, singles, families and groups, enjoying the riverside. The further away from Seoul the fewer bikes there were. It was noticeable that all the Koreans were riding expensive multi geared mountain bikes with suspension but the slightest hint of an incline and they were off the bike and pushing to the top. Sections of the cycle path run underneath the raised motorways which follow the rivers. So you can cycle in shade and, with not so much noise transmitted downwards, it is very peaceful. We turned off the Han river to follow the Bukhan river north east. 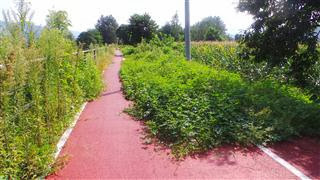 This valley also has a more recently completed cycle path all the way to Chuncheon. Along the way were lots of shady rest areas and stalls selling drinks and snacks. About 3pm we decided to find somewhere to stay but the only accommodation were seedy looking motels with no receptionist, just a machine for the money and how many hours would you like? At Cheongpyeong we gave up looking for anything better and booked into a motel with a receptionist. These places are very well equipped, with all the usual shampoo, shower gel, hairdryer but also conditioner, moisturiser, big tube of toothpaste, condom, cotton buds, razors, brush, comb and hair gel. The one thing they don't have is big towels. The ones provided are the size of small hand towels. A big flat screen TV with several English language channels and computer are normally included also. The town was quite small but as we wandered around looking for food we spotted a chef in whites and tall hat preparing sushi and had a great, but expensive meal of tuna. The one thing the motels don't provide is breakfast, but there was a coffee shop down the road. French bakeries are very popular in Korea and most of them serve coffee and have seating. There wasn't a cloud in the sky as we set off, crossing over to the other side of the river. People were fishing there with short rods, wading along pulling big keep nets with their catches. The cycle path at this point leaves the river Bukhan to follow a tributary valley along an old railway track. The replacement railway is on one side with the river on the other. This project has only just been completed and there were fewer cyclists and not so many seats or refreshments. The only shade at lunchtime was in the car park underneath the railway station.This area of Korea is due to host the 2018 winter Olympic games, advertised on the posters at the side of the road. Rejoining the Bukhan river we continued our Seoul-Yeonghae-Bicycle-Ride below the old railway bridge. This section of the track has been converted into a 'railbike' track, very popular here. 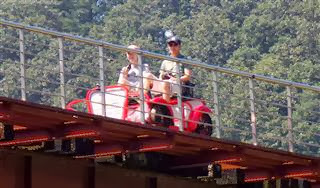 Small cars powered by four passengers pedalling. The last section of cycle path at side of main road was closed. The sign was in Korean only but was pretty obvious. We crossed onto the other side of the river onto another, longer and uphill cycle route into Chuncheon. Lunch was the dish for which the city is famous, chicken marinated in hot chili sauce and cooked on a table centre charcoal barbecue, served with lots of pickled vegetables (kimchi). It was only 2pm so we decided to carry on north to Hwacheon as we had an idea that the cycle path continued up to there. After 8km the path we were following stopped at the busy highway and the only quiet road to Hwacheon was over a big big hill. So we returned to Chuncheon and stayed there overnight. We went to nice coffee shop for breakfast and brought snacks and drinks for the rest of the day. The sky was clear and the sun already hot as we rode out of the city along the river banks following various cycle paths. They were little used and somewhat overgrown with creepers. Ahead of us was the dam which forms the big reservoir which we would be cycling around later. Crossing the river we started the first climb of our Seoul-Yeonghae-Bicycle-Ride up the old Highway 46. A new road, with exactly the same number, has been constructed, climbing up the valley through a 5km tunnel. So the old road is perfect for cycling. Three lanes wide, smooth tarmac, no traffic and no noise from the new road. The gradient was steep in places, up to about 15%, but having the whole road to use meant we could zig-zag up the steeper bits. There was a slight moment of panic when about 3km up the climb we came to a road block with a Korean sign which we couldn't translate. The central section was open. We assume the road is closed at night because of the landslide damage and just rode through it. There were a couple of badly damaged sections but it seems unlikely that they will be repaired any time soon. The top was just above 600m and then a short descent to join with the new highway for about 10km on a broad hard shoulder. A roadside cafe served a delicious spicy noodle soup for lunch. Re-energised we continued up a slight climb on the highway and through a 1,800m tunnel. There was no alternative road here but the tunnel was well lit and the traffic not too busy. Just beyond the tunnel we turned off the highway again to follow the old road which contours around the hills above the pretty reservoir. With hardly any traffic it was incredibly peaceful. 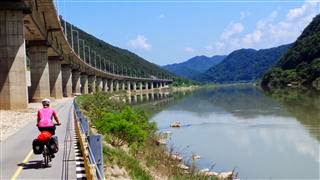 The road dips into several valleys, crossing under the new highway which passes through five tunnels and crosses the valleys on high raised bridges. 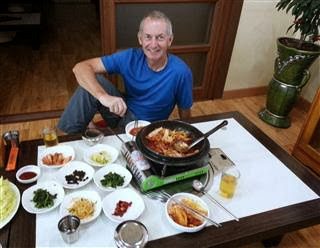 We had to re-join the new highway for the final 6km, into Yanggu, where we booked into the Central Motel for the night. It looked the newest and cleanest of the five that were all together at the top of the town. Walking out to look for something to eat we bumped into an English girl, working as a TEFL teacher at the local school. She was staggered to see Westerners in the town. This town is less than 20km from the DMZ and the military presence was very noticeable. 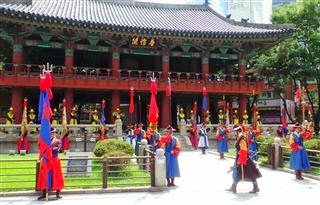 For the next two days our Seoul-Yeonghae-Bicycle-Ride would follow highway 31 south, through the Naerincheon river valley. Leaving Yanggu we started a 350m climb up a wooded valley. There were soldiers everywhere. Most of them were young recruits on training exercises. They all looked far too young to be in the army. The roads north into the DMZ had soldiers controlling access. Just before the top of the hill we stopped for drinks in a little cafe. 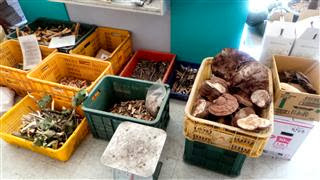 There was a shop selling all sorts of forest fungi as well as expensive ginseng. The man who owned it had lost both of his hands but still was able to drive a car and carry bags. 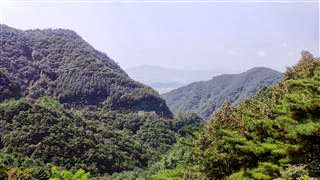 A short tunnel saved us from the last 100m of climbing and then came the exhilarating downhill into the areas which saw the most intense fighting of the Korean war. 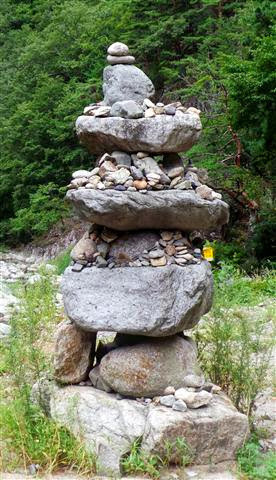 This brought us into the river valley and we began a gradual climb. 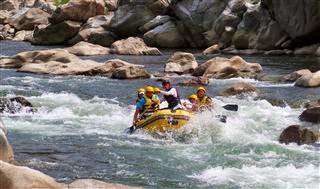 The river is used for whitewater rafting but the water levels at this time of year are quite low and although some rafts were descending they were having problems getting along in the still waters and kept running aground on the rocks. The lower part of the valley was rocky, narrow and scenic but as we climbed higher it was wider and less attractive with lots of agriculture, mostly market garden crops. We stopped for the night at Girin which has a large army and air force base. The town was pretty grim and the row of motels along the road all looked grotty. We picked one at random which as expected was not very clean, with bedding that didn't look to have been washed recently so we slept in our silk sleeping bags. With so many military personnel it served mainly as a brothel and we were kept awake all night by the customers on the corridors. Today's ride was a hard one, with over 1100m of ascent, continuing on Highway 31 up the river valley. The road was busier with many heavy lorries and this section of the valley broad and boring. 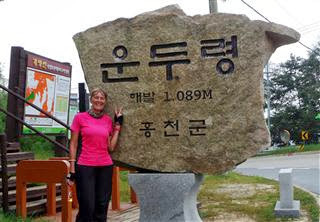 We had a climb up a small bluff before dropping down to Sangnam Myeon and a coffee stop. The 31 started another climb ahead of us so we checked the map and found a small, possibly unsurfaced, road which followed a winding river valley, rejoining the highway after about 8km. It starting well with a sleek tarmac road. This ended after 1km and became a rough, stony track that was regularly washed out with floods. It was a difficult ride with loaded bikes and we wondered if 7km of this would be too exhausting. But 1km further on it went onto concrete and was surfaced all the way to the junction back onto the 31, a lovely scenic valley. At lunch time we saw a little bridge over the river below the road and dropped down a steep cemented road to sit on the banks and cool our feet in the water while we ate our sushi and cakes. The hot afternoon didn't help as we continued to climb up the gradually shrinking river. The serious climbing started at the 60km point and we gained 450m in the next 8km. By now we had left all the traffic behind and except for some roadworks everything was quiet and still. Squirrels ran across the road and butterflies and wild flowers decorated the verges. At the top was a row of cafes, with old ladies trying to entice us into their establishment. After a rest and a cold drink there was the 500m descent to enjoy in the evening sunshine. Soksa was just a tiny place, in the shadow of the elevated Expressway 50 but there was a good motel with a little restaurant and a 7/11 over the road. We showered and changed quickly and went over to the restaurant for our tea. It was a typical Korean place with low tables and no chairs, shoes off at the door. The lady owner phoned her daughter, who could speak English, to translate the menu for us. She served us a delicious hotpot with meat and seafood accompanied by colourful and tasty side dishes and a couple of bottles of beer. 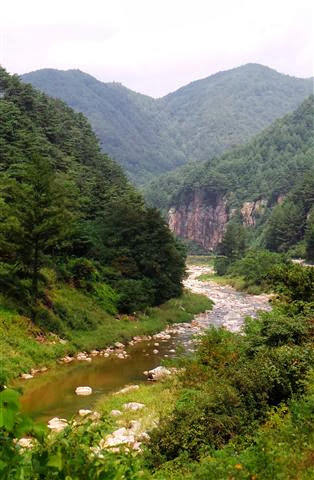 This part of the Seoul-Yeonghae-Bicycle-Ride should have been a lovely ride today, mostly downhill through a beautiful winding and steep sided river valley. But it rained....seriously heavy stuff with a strong, gusty wind. The rain started just as we walked out of the motel so we ran over to the 7/11 for breakfast, hoping it would stop soon. After 40 minutes it was plain there would be no respite soon so we set off in our ponchos. To begin we had to climb on highway 6 around a mountain. The new expressway goes straight through the mountain but the highway climbs up and around it. We didn't realise there was the old road at the side of this newer one with no traffic on it. 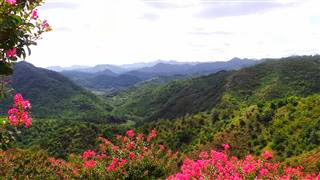 Once at Jinbumyeon we joined the Jeongseon valley on Highway 59. The ride was generally downhill all the way which was good because of the ponchos and the copious pools of water on the road. There were regular bus shelters all the way down so we could stop and get out of the deluge for a while but very little habitation and not a single cafe. On the way was a beautiful ribbon waterfall tumbling about 100m down a cliff but the torrential rain meant it was impossible to get the camera out. It wasn't all downhill though, with two surprisingly difficult climbs. First one only about 100m over a bluff, but the gradient felt much steeper than the 10% sign suggested. The second one was higher, with the wind forming vortices which threatened to blow us off the road. We reached Jeongseon about 2pm and found a little cafe for a very enjoyable and necessary late lunch. The sun was shining again today and as we left Jeonseon on Highway 59 we were treated to a lovely view of the river and mountains which had been completely swathed in clouds yesterday. Once again we got somewhat confused by the old and new roads, both numbered 59 and almost ended up going through a new tunnel before turning back over the river and onto the old road. The whole day was spent in river valleys, gently climbing into the mountains. Leaving the highway, we took NR 424 and then 412, along an impressive gorge with pine clad slopes. Further up the valleys there was more agriculture. Recently harvested chillies were spread out in the sun to dry. 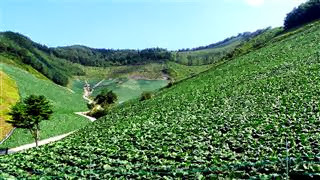 Beyond that the steep slopes had been cleared of trees and planted with cabbages. They went on for miles and miles, all the same type and no other crops. It was a shock to see them growing like this and the vast amounts of soil washed off the slopes by the rain suggested it was not a good idea. Such extensive monoculture must entail the use of lots of chemicals. It was certainly enough to put you off cabbage for a while. At the valley's end was a steep climb up to 1,000m through the cabbages and back into the forest again. From there it was mostly downhill, turning onto Highway 35 and into Taebaek. This is an old coal mining town, now a centre for mountain activities and reminded us of some of the alpine mountain towns. Getting through the town was difficult as they were in the middle of laying very smart new stone pavements so the traffic was chaotic and the road very rough. Walking round the town that evening we had our first sighting of a 'handbag cat'. Having seen plenty of small dogs carried in bags it was a shock to hear this cat meowing loudly at an outside cafe table. We saw a couple more further south in Korea. Today's section of the Seoul-Yeonghae-Bicycle-Ride started with the most horrible aspects of a cycling day at once. Torrential rain, low cloud, uphill straight away on a busy trunk road, heavy traffic and road works. Oh and did I mention the head wind? With the poncho's on it was a battle against the wind so the 100m climb took masses of effort. After the crest of the hill there was a downhill glide but the rain intensified and the clouds got lower. A little cafe offered a bit of respite so we dripped our way inside, much to the amazement of all the locals. We had coffee with an added measure of some sort of local liqueur and a packet of digestive biscuits. The rain eased and the clouds lifted so we set off again. There was only another kilometre on the main road before turning onto the 416, a much quieter local road After a slight climb through a wooded valley there was a 2km tunnel, for once a blessing as it was a shelter from the rain. On the other side of the tunnel the rain seemed lighter and from there the road descended for 40km all the way to the east coast. The temperature slowly increased and the rain stopped so we gradually shed some layers and enjoyed the beautiful scenery. This valley is much more rural than any of the ones further north. The houses are small and more traditional in style. 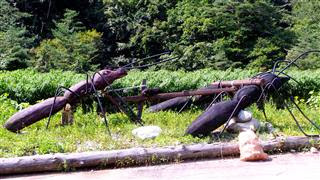 The farming is traditional mixed arable with rice, melons, beans, onions, garlic and chillies (not a single cabbage). About half way down the valley narrowed into a steep sided gorge. 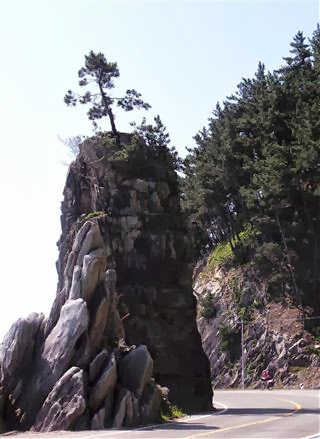 Finally our Seoul-Yeonghae-Bicycle-Ride took us within site of South Korea's east coast. There were roadworks ahead and a workman on traffic control duty. He had his back to us and was on the phone so didn't hear our approach, even though Steve rang his bell. Our sudden arrival startled him and he gave us a lecture in Korean, which we didn't understand and waved his illuminated stick quite a bit, before letting us go through. There is a motorway along this section of the east coast, which is where most of the traffic is, meaning the old main road is a quiet and enjoyable route for cycling. The coast has some nice sandy beaches and good views from the hilltop viewpoint, but is somewhat marred by the enormous nuclear power station. 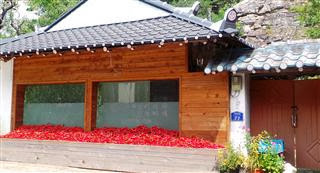 We booked into a motel in the fishing port town of Jukbyeon. It seemed like it should be a busy little holiday place but there were no holiday makers. The harbour was lined with fish restaurants, with racks of tanks filled with all manner of seafood but the restaurants had hardly any customers. Instead we went into a tiny little sit on the floor place with only two tables. One of them was already occupied by a lively group of locals celebrating a birthday with the usual large quantities of Soju. They gave us big slices of birthday cake for our pudding. At 9am in the morning there was absolutely nowhere open for breakfast. It's difficult to get used to the fact that very few accommodations here serve breakfast. We tried to find a route along the old 7 road, now replaced with the motorway. It wasn't easy, even with the combined information on the paper map and the sat nav. Getting to Uljin was enjoyable, riding along narrow concreted lanes, through farmland and small villages. There we found a' Paris Baguette' for breakfast, thank goodness the Koreans love their 'French' bakeries. 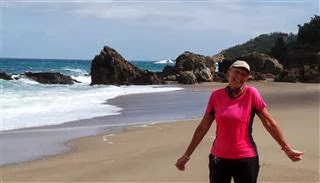 South of Uljin NR 917 hugs the coastline for the next 12km. Along here were some lovely views and interesting cliffs but these were marred by high wire fences and lookout towers, remnants of the Korean War. The next section was very difficult, with the old road weaving from side to side of the new one, now just a highway, not a motorway. At some points there was no option but to ride on the hard shoulder. At lunchtime we rode round a town looking for a cafe but had to go to a 7/11 and buy a picnic which we ate outside the police station. Still trying to find a route away from the busy highway we followed a rough track up a hill and ended up in a small quarry. At this point we gave up and returned to the highway for the next 6km. 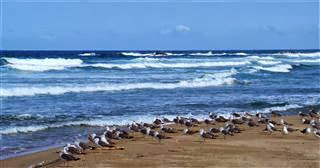 South of Pyeonghae there are several bays with sandy beaches but at this time of year they were all deserted. There are quite a few motels but although the doors were open there was no reception, just a phone number to ring and we were concerned whether any of the restaurants would stay open with so few customers. So we continued on to the next major town, Yeonghae, about 8km further down the coast and the end of the Seoul-Yeonghae-Bicycle-Ride but only the first half of our Korean adventure. 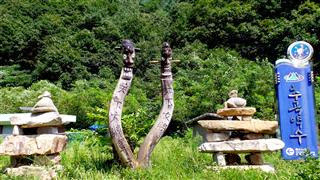 After a well deserved lie-in we went to the Goesi ethnic village, just outside Yeonghae. We wandered along the sandy lanes with their tile topped walls, peeking into the nicely restored houses, most of which are still lived in. There was no-one around and the only sound was from the temple on the hillside with a solitary monk chanting mournfully. 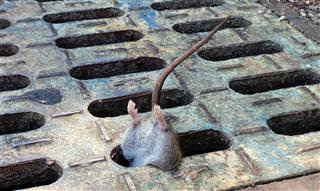 We giggled at the dead rat in the drain cover, obviously only recently deceased, and tried to figure out how exactly he had died, aren't rats supposed to be able to get through the narrowest of spaces? 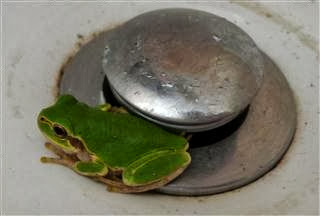 When Karen went to the 'ladies' she found the sink occupied by a bright green frog. The rest of day was spent on beach, sleeping in the shade of the pine trees and having lunch of raw fish, lettuce and pickles at a little seafood stall against the harbour at Daejin.